Policies and Autonomy – Uncomfortable Bed Fellows? Let us look at some implicit assumptions about rules and policies in an organization. For one, it dumbs down the ability of the individual employee and downgrades/ degrades her identity. For example, we could argue that by having an HR policy for leave or work place/ hours, you have implicitly downgraded the employee’s judgment and ownership. Perhaps, by doing this, you have also inadvertently increased the divide between us (employees) and them (management). Not the ideal nurturing environment we want in organizations. In the ideal world, we would expect the employee to take leave in a way that doesn’t negatively impact any deliverables or commitments that the company has made to its customers. You don’t require a five-page policy for this. Another way to think about this – it would be bizarre for a family to have a well-documented and defined policy for when the parent takes a day off/ vacation from taking care of children or home. When a parent needs to take time off, the rest of the family members pick up the slack and this happens without any written rule or policy. Much of the behavior of the family is determined by context and circumstances. The family operates on some broad implicit unwritten rule and context; in this case, it may be that they are going to work towards taking care of the kids and working in the family’s best interest. 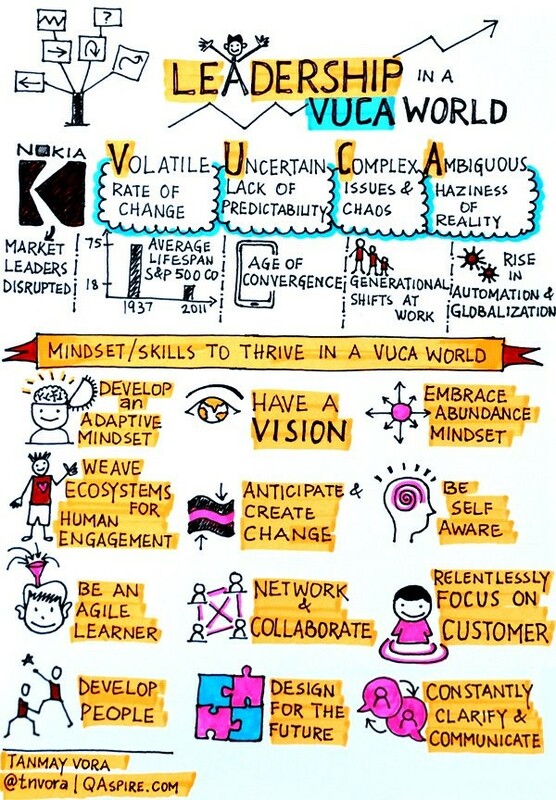 To the current VUCA business reality, add to the mix the expectation of creativity and innovation. This multiplies the problem multi-fold. We often hear that culture is the most important and difficult part of the Agile transformation. The question that begs itself then is – what does culture mean in this context? They are a composite of the behavior and skills displayed, rewarded and valued in the company. We intuitively see and understand culture all the time in our organizations and teams. When we see that the frontline of the organization is empowered to speak up and make decisions we know the culture of such a company. Alternatively, when we know that in a team meeting it is only the senior manager who speaks her mind and/or for every dollar spent there needs to be a prior approval taken we know the culture of this company. Culture and leadership in today’s VUCA and innovative world are changing the age-old paradigms of team and leader. In a seminal experiment called the marshmallow challenge, some crucial counterintuitive insights have emerged. The challenge itself is very simple – a team of four, 20 spaghetti sticks, 1 meter of tape, 1 string, 1 marshmallow and 18 minutes. The challenge is to build the tallest standing structure using these items. Only one rule, the marshmallow must be at the top. This challenge has been taken by teams of CEOs, business school graduates and kindergarteners. The kindergarteners always beat the CEOs and business school graduates and make the tallest standing structure. The reasons for this bewildering result can be broadly put into two buckets. First, unlike the CEOs and business school graduates, there is no jockeying for power, leadership and roles with these small kids. There is no top-down hierarchy and one could say it is like a self-organizing team, with few or no titles, and flat agile team structure. This saves them crucial time, and everyone contributes. Second, unlike the CEOs and the business school graduates, the kids don’t go about discussing and elaborate planning of what to do, they don’t plan to get it right the first time, they just go about doing it. They fail multiple times, the structure keeps falling, but in the end, they just figure it out by rapid prototyping it multiple times, another well-known agile method, and have the tallest standing structure. If we think about it, no one taught these five-year olds this method, it comes naturally to them. And, I think it is a behavior that comes out of no fear of failure and lots of safety and no clutter in the mind. Who Needs Managers at Google? This brings us to the often-underappreciated issue of safety nets and trust in teams. If you have really empowered the frontline to make decisions, you must also ensure that you build appropriate safety nets for these teams. After all, they are bound to fail despite their best intentions and efforts. A few years back Google did a study to determine the effectiveness of managers. They undertook this multi-year project called Project Oxygen with a hypothesis that engineers generally felt that “managers at best are a necessary evil, but mainly they get in the way, create bureaucracy, and screw things up”. To their surprise, it turned out that managers did matter. They identified 8 key behaviors that make a good manager. One of the most important behaviors was the ability to create an inclusive team environment showing concern for team success and well-being. Building trust in the team was key for an inclusive environment. As Google puts it, “In a team with high psychological safety, teammates feel safe to take risks around their team members. They feel confident that no one on the team will embarrass or punish anyone else for admitting a mistake, asking a question, or offering a new idea.” You can read more about this project at https://hbr.org/2013/12/how-google-sold-its-engineers-on-management. Amy Edmondson, a Harvard Professor who has done a lot of work in psychological safety of teams, says, creating a psychologically safe environment is both a responsibility and an expectation. The most crucial information for the job to be done may be missed out if people in the team resort to the default low-risk behavior of not speaking up or airing their views because of the risk of being criticized or put down, especially by their superior. According to Amy, creating safety in a group or team is one of the hardest and most difficult part of a manager’s job, especially when she has to balance this with the other dimension of real-life performance. The need for safety is biological and is deeply embedded in the mid-brain part called amygdala. The amygdala is ever scanning for danger in the environment and is hypersensitive to perceived threats that often trigger a “flight or fight” response. 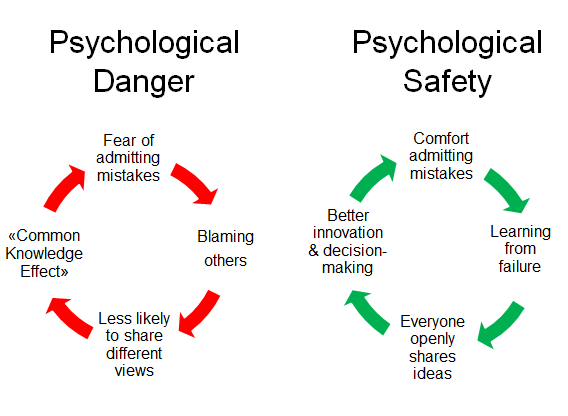 The lack of safety creates a mental and emotional environment where the person is only focused on one thing – survival. In this environment, it is difficult to expect dedication, perseverance, excellence, creativity or change. Dan Coyle in his book “Culture Code” says that “it has been recently discovered, however, that the amygdala also plays a vital role in building social connections. It works like this: when you receive a belonging cue, the amygdala switches roles and starts to use its immense unconscious neural horsepower to build and sustain your social bonds.” Dan further adds, quoting Jay Van Bavel, a social neuroscientist at New York University, “The whole thing flips, the moment you’re part of a group, the amygdala tunes in to who’s in that group and starts intensely tracking them because these people are valuable to you. They were strangers before, but they’re on your team now, and that changes the whole dynamic. It’s such a powerful switch—it’s a big top-down change, a total reconfiguration of the entire motivational and decision-making system.” Lack of psychological safety also leads to a decrease in important neurotransmitters like serotonin and oxytocin that are important for wellbeing. As Antoine de Saint-Exupery so eloquently put it, “If you want to build a ship, don’t drum up the men to gather wood, divide the work and give orders. Instead, teach them to yearn for the vast and endless sea.”. Would love to hear your views on these things. Very well researched, comprehended and presented. “creating safety in a group or team is one of the hardest and most difficult part of a manager’s job, especially when she has to balance this with the other dimension of real-life performance.” The trick probably is to communicate clearly and establish the link between safety and performance. Very well written. Simple, no ambiguity, clear and concise too for the detailing provided. One cultural aspect that has been pointed out very well in the example of children doing well versus seniors / oldies was very good. The safety net that managers should provide and remove the uncertainties to avoid looking only for the self and not for team was well explained. Good read !!! Extremely well -written and thought provoking!. 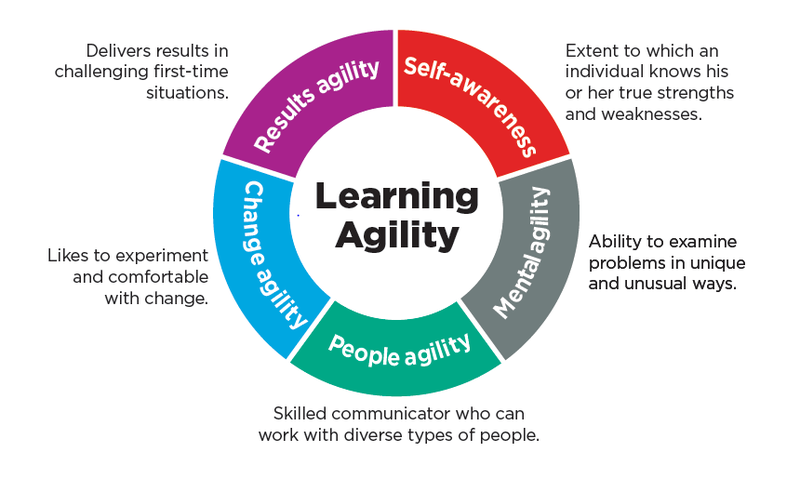 I couldn’t have agreed more on the analysis- that “Agility” is much more than method . In-fact, probably just basing out of this article – I may say of the 3 Ms (methods, mindset, mindfulness)- the methods may be the least important (Not saying that methods are not needed..). I am of the opinion that these meta-skills for an individual/organization are an absolute must for agility mindset/practice to thrive and prosper.